In your job, there are a lot of circumstances where you have the opportunity or the need to transfer to a new post or a new location—new vacant posts, change in address or relocation, family illness, and a lot more. 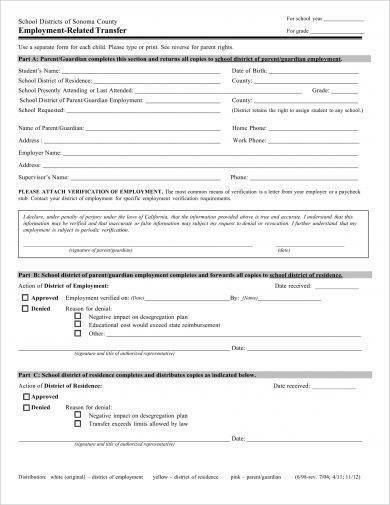 In these circumstances, it is either you are requesting to transfer to a posted position or you are requesting to transfer for personal reasons. 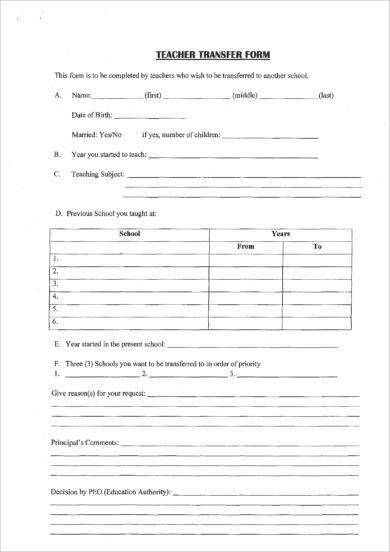 You may also see application letter examples. 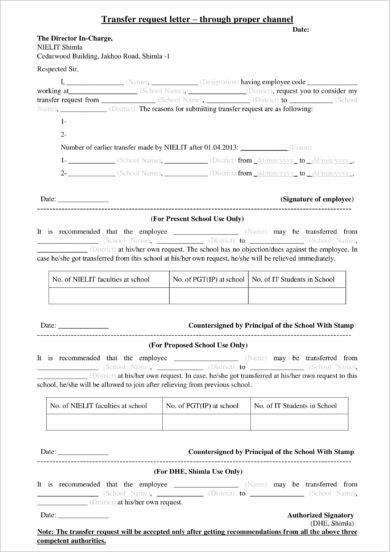 Either way, when you are filing your request, you must write it in a formal document called job transfer request letter. 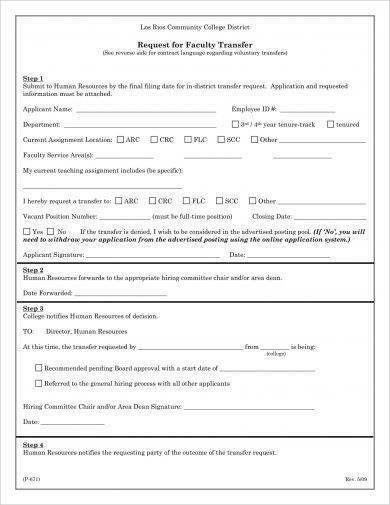 This letter is closely similar to a resume cover letter in a way that it is like you are applying for the position, but it is different in a way that you are applying as an internal applicant with a home-court advantage. However, you still need to showcase your skills that the company needs from you and how you are a valuable asset for the company. More on these discussions can be found in the succeeding sections of this article. 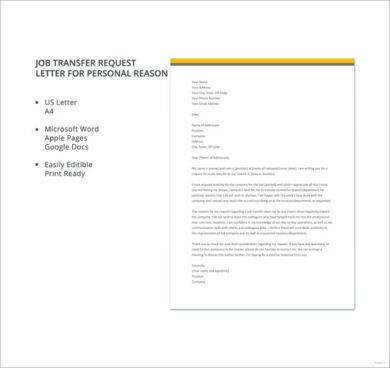 Below are some examples of job transfer request letter that you might find useful. 1. You have to sell yourself as well as your abilities. Firstly, the similarity between a job transfer request letter and a resume cover letter is that you need to sell your abilities to the hiring supervisor. You need to showcase your abilities so that they will know whether or not you are fit for the position. You have to ensure that what you are writing in your letter will be suitable for the position they are hiring. 2. You have to communicate your strong points efficiently, if possible, in one page. It is ideal that you communicate your strong points in one page so that it would be easier to read and it would appear more professional. Depending on the position that you are applying, you can be as creative as you desire but up to a certain limit. For example, if you are applying for a certain position in an accounting firm, it is expected that your letter would be formal and proper. On the other hand, if you are applying as a graphic design artist, you can showcase your skill through your letter by incorporating quality designs. You may also see email cover letter examples. 3. You have to show the hiring supervisor the great things you can do for his or her division. You must show them how they can benefit you when you are placed in the new position. 1. 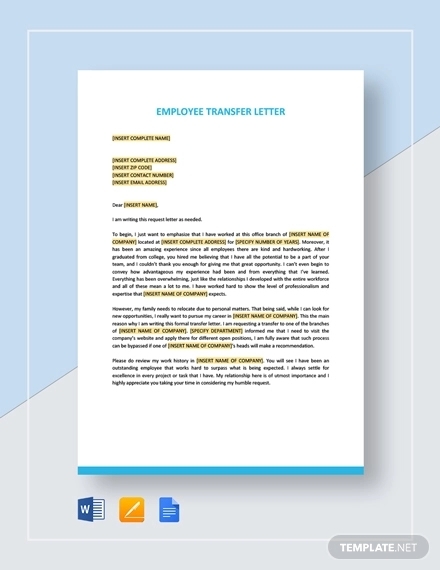 A job transfer request letter and a resume cover letter are obviously different, but one key difference is that in a job transfer request letter, it is like an internal application while in a resume cover letter, an applicant external from the company is applying for the position. 2. Another difference is that, sometimes, a job transfer request letter is strictly personal, for example, because of family illness or a change in circumstances is forcing you to relocate, the reason why you are writing the job transfer request letter in the hopes that you will be transferred to another location. You may also like business reference letter examples. 1. Your purpose for writing. Get straight to the point and state your purpose in writing your letter, that is, to transfer to a new posted position within the company. 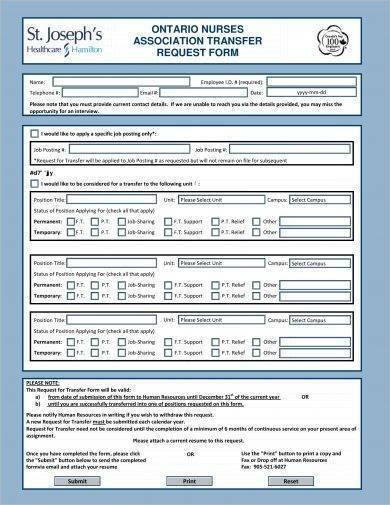 You must be direct with regard to this point so that your sample application will not be ambiguous. 2. Highlight your abilities as well as your experience. An important point that you must highlight are your abilities and your experience. Your abilities will tell the company how fitting you are in the position that you would like to be transferred to while your experience will show the company how efficient you are as an employee. It would also be an edge over the external applicants if you are stating that you are from the same company since they already have records with regard to your performance and they somehow know a part of you in some ways. You may also see simple resignation letter examples. 3. Clearly praise the company. You may also praise your company as this will surely be an added points or bonus on how well you know the company. This would also mean that you have known the company for so long and that you are already familiar with the company. You may also like notice letter examples. 4. Tell why you want to move up in the company. Almost always, people who would like to transfer to a new position would like to transfer to the next position in the ladder. This means that they are moving up in the company. You must state the reason why you want to move up in the organization—self-enhancement or self-improvement, perhaps. 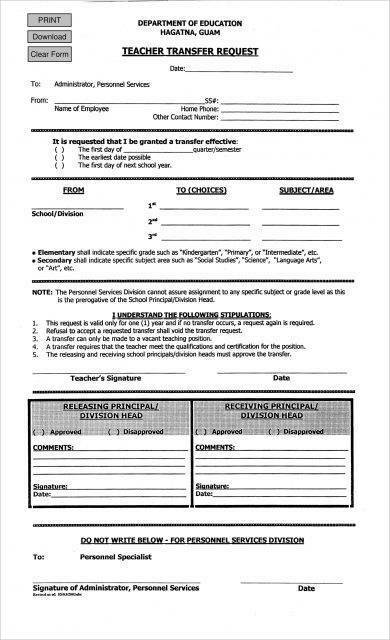 You may also check out employee reference letter samples. 5. State what you can do for the company. You must be focused on what you can offer to the company in a way that it would not sound like you are bragging. Keep a humble tone and display your strength points well. For job transfer request letter made for personal reasons, you have the advantage of making it specifically to fill an open post or position. Instead, you need to state why you need to transfer. 1. Your achievements and skills that they need. You must showcase these important assets that they are going to lose if you will not be transferred in a certain post. Explain how valuable they are and how can the company benefit from you, but always remember to state them without bragging the things you have done in the past for the company. You may also see business proposal letter examples. 2. 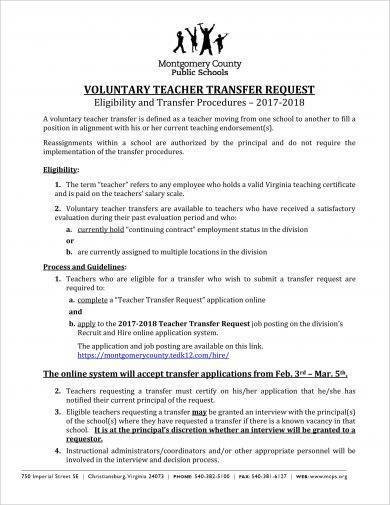 You must also state why you need to request a transfer especially because this is relating to personal desire and circumstances. Be honest in your request. It is better that you are truthful on your reasons than being caught by the company of giving false reasons for your request to transfer. You may also like incident report letter examples. 3. Remember to be appreciative of what the company has done for you, and don’t forget to praise and thank them. This not only shows respect and courtesy but also signifies that you know the company well. 4. Because requesting to be transferred to a new post would also mean leaving your post empty, you must offer a plan for transition including training a new person for your position in preparation for your leaving. Surely, it is hard for the company to look for someone who can train a new hire in case you leave. 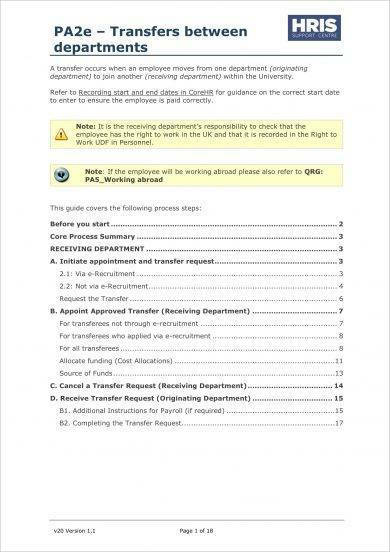 So, state in your professional letter that you are willing to offer and extend a reasonable time in your post before you leave should you be granted to transfer to another post. Starting to write a job transfer request letter may be challenging for some, especially those who find writing not their forte and their usual task. It might be a bit overwhelming when you do not know how to start your official letter, the format of the letter, as well as your content. You might also need to consider the flow of your sentences, grammar, spelling, and tone of your simple letter. With all these things in mind, we sometimes get stuck and stare at a blank page of paper for hours, but still don’t know what to say, how to say it, and how to start writing the letter. The good news is, you are not alone. 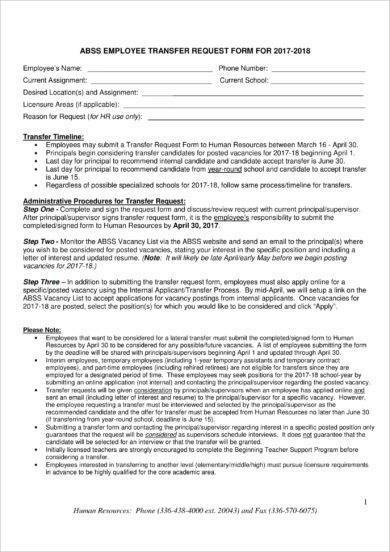 Although writing a job transfer request letter might be challenging, we know you can make with the help of the discussion below. Writing a general letter does not really require someone to be a pro or an expert. 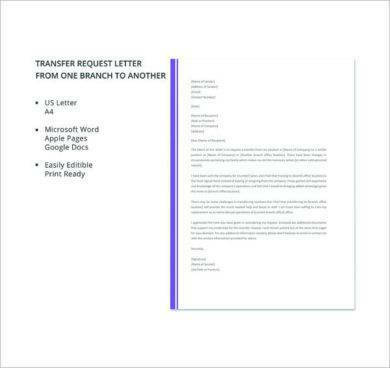 With the correct format and complete content, you can surely create an organized and formal job transfer request letter. 1. Your contact information, date, the contact information of our supervisor or human resource manager. 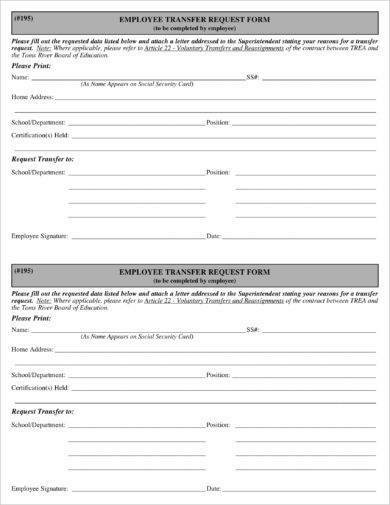 Your job transfer request letter must be written as a correspondence and it should begin with your contact information which includes your address, the date of the letter, and the contact information of your supervisor or HR manager. You may also see complaint letter examples. 2. If you are sending a professional email, you can include in the subject of your email the purpose of your request whether it is for transfer or relocation. Writing a good and comprehensive subject is important so that the recipient will know the content of your email and its level of importance. Hence, avoid vague subjects in your mail and be straight to the point. 3. Formal salutation. Before writing the content of your formal email, you must have a formal salutation such as Dear Mr./Ms., Dear Sir or Madam, Dear Human Resources Manager, Sir, Ma’am, or To Whom It May Concern. 4. In your content, you must include your purpose for writing and, if possible, the evidence supporting why your request should be considered. You must be direct and clear in your purpose, and as much as possible, the evidence supporting your request must be logical and valid for you to have a greater chance to be granted with your request to transfer. You may also like thank-you letter examples. 5. You may also politely request the supervisor’s assistance in gaining the position that you would like to be transferred to, and express your appreciation for their help and compliment them and your colleagues in your current job. You may also check out offer letter examples. 6. Also state that you are willing to help in training a new hire for your post should you be transferred to your requested post. 7. In closing your letter, use an appropriate closing such as Sincerely, Best Regards, Regards, Yours Truly, and Yours Respectfully. 8. Include a copy of your resume along with your transfer request letter and make sure it is an updated one and tweaked to match the job description of your target position. 9. Before sending your letter, proofread everything, ensuring that there are no typographical and grammatical errors. Lastly, always remember that the more professional you are in your letter, the better your chances of having your request transfer letter approved. Hopefully the above tips can help you in your letter, and the examples would enlighten you and serve as your reference in writing your letter.